Describes the traditional hymns sung on the Feast of Corpus Christi. Grant us the strength and help we seek. Finally, there is the sequence of the Mass, Lauda Sion Salvatorem (Sion, praise thy Lord and Saviour). 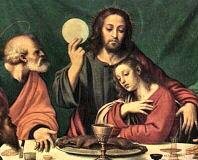 Saint Thomas enumerates in unmistakable words the main truths of Christ's revelation and the Church's teaching about the Holy Eucharist. In many countries a translation of this sequence into the vernacular is sung by the people as a popular church hymn in honor of the Blessed Sacrament. The most famous nonliturgical hymn in honor of the Blessed Sacrament is the ancient prayer poem Ave Verum Corpus (Hail, true Body). It appeared first in manuscripts at the end of the fourteenth century and is ascribed to Pope Innocent VI (1362). Its original purpose was to serve as a private prayer for the faithful to be said at the elevation of the sacred Host during Mass (In elevatione Corporis Christi). This jewel of sacred poetry soon spread through most Catholic countries of Europe.